Improv 101 is a one-off, introductory class to teach you all basics of the art of improvisation. Students learn the core improv concepts of "Yes, and...", celebrating failure, and making your partner look good to collaboratively create scenes and stories on the spot. Through exercises and games, this class will guide you toward better listening skills, to trust your creative instincts, and be present in the moment. There's no need to "be funny" or "clever". This class will show you that everyone can improvise and, in fact, you're already doing it every day. Whether you want to do improvisation on the stage or be a better communicator or more spontaneous off-stage, this class is a great place to start! Improv 101 is a class for adults so participants must be at least 18 years of age. We offer youth classes in sessions for younger improvisers. Check out our Youth Classes to find a class! 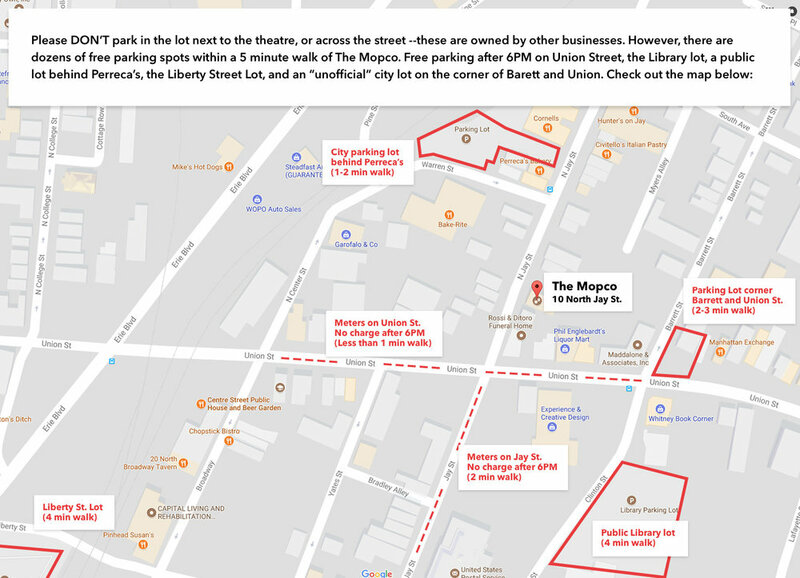 Street parking is available on Union and North Jay street by our Theatre. Parking is also available in the municipal lot behind Perecca's as well as other public lots within a short walk of the theatre. The lot directly across from us is reserved for the Rossi & Ditorro Funeral Home and is NOT AVAILABLE for parking. DO NOT park in the lot by JoJo’s Auto Service or you will be towed. Find out more and see a detailed map of parking options available to us here. That's fine! There's no greater gift than an improv class (we hear). But please contact us so we are sure who to expect the day of class.